A broad view of this massive ballroom which seats 2,100. Minnesota Prairie Roots file photo June 2015. SIXTY YEARS AGO ON FEBRUARY 3, a charter plane crashed into a northern Iowa field killing all aboard. It was, they say, the day the music died. Portraits of the deceased musicians. Minnesota Prairie Roots file photo June 2015. Dead were rising musicians Buddy Holly, Ritchie Valens and J.P. “The Big Bopper” Richardson. 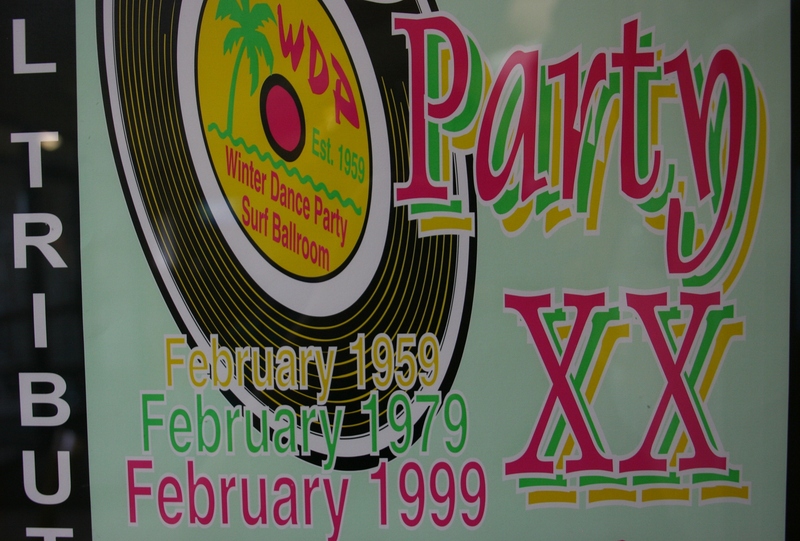 All around Clear Lake, you’ll see posters from the annual Winter Dance Party at the Surf Ballroom. I found this one at the AmericInn Hotel. Minnesota Prairie Roots file photo June 2015. This weekend the Surf Ballroom in Clear Lake, Iowa, continues its Winter Dance Party honoring those singers who performed there before that fatal flight en route to Moorhead, Minnesota. 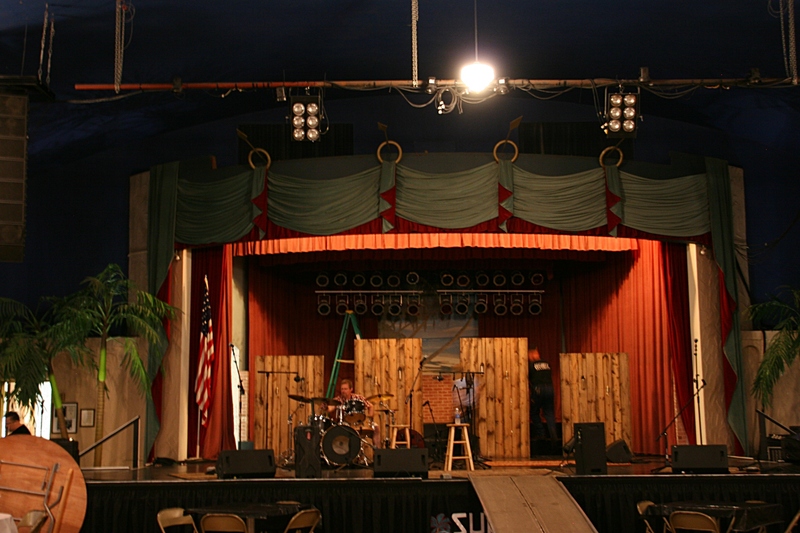 The ballroom stage. Minnesota Prairie Roots file photo June 2015. Several years ago I visited Clear Lake, a delightful lakeside community just across the border from Minnesota. That trip included a stop at the Surf Ballroom. My knowledge of the famed musicians and of music in general is rather limited. But I do remember Don McLean’s lengthy American Pie hit from 1971 with that repetitious the day the music died. That line references the deaths of Holly, Valens and Richardson. I never understood that as a teen. I simply liked the melody, puzzled by the words. 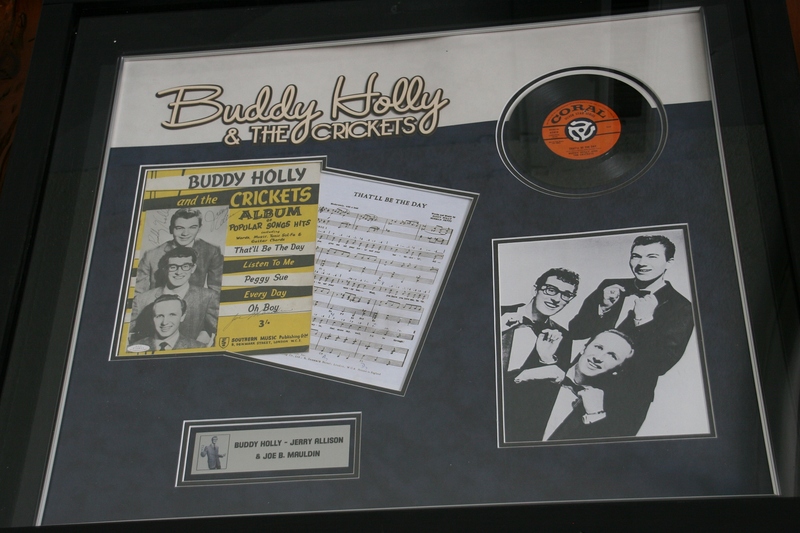 Another tribute to the Surf’s most memorable performer, rock and roll legend Buddy Holly. Minnesota Prairie Roots file photo June 2015. I am of that era when rock and roll represented rebellion with young people challenging societal norms and authority, voicing their opinions via music. It was a time of turmoil in many ways. A time of change. This display references American Pie. Minnesota Prairie Roots file photo June 2015. 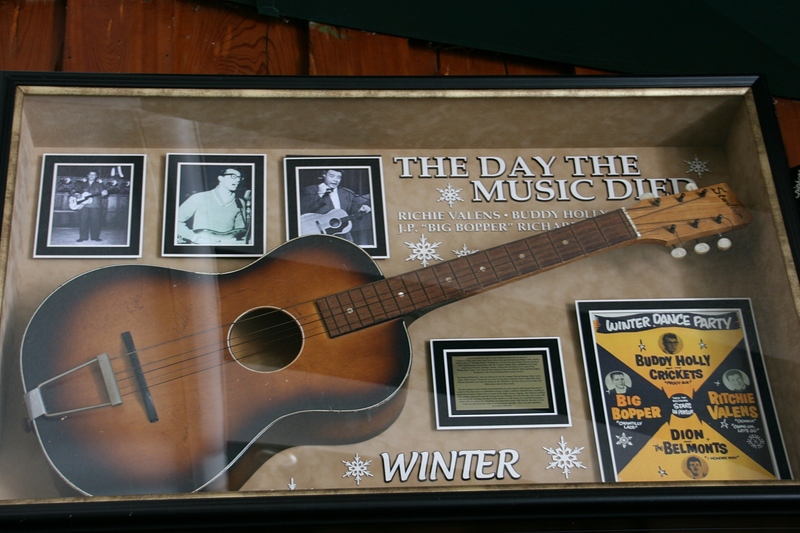 The February day the trio of musicians died in 1959 in Iowa really wasn’t the day the music died. Rather, rock and roll continued to rise, flying, soaring, reaching new heights of popularity. 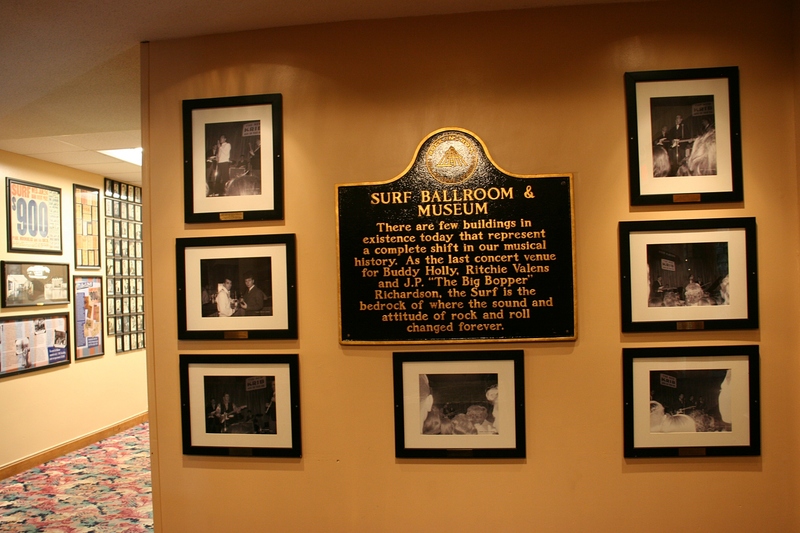 TO READ MY ORIGINAL POST on the Surf Ballroom, complete with more photos, click here. This alley of art in Clear Lake, Iowa, impresses me. Minnesota Prairie Roots file photo 2015. I NOTICE DETAILS, always have. This heightened awareness weaves into my work. I write and photograph with a strong sense of place, a quality instilled in me long ago by growing up on the prairie. In that vast space of sky and land, every nuance of the environment imprints upon the soul. My reactions to a place evolve from first impressions, most often viewed through my camera lens. I see the world in details of color, balance and perspective, of light and mood and texture and more. An alley in Milaca, photographed in September 2017. With that background, you can perhaps better understand why, when photographing a community, I notice more than the slick fronts of buildings, the parks and other attractions tourism offices promote. I look beyond those to the alleys, the roof lines and even the sidewalks. The details. The scene along a balcony on the back side of a building along Third Street N.E. in downtown Faribault, just across the alley from the post office is one of my favorite alley photos for the story it tells. Minnesota Prairie Roots file photo July 2015. It is the alleys in particular that draw my visual interest and show me the side of a community often overlooked. And too often neglected. There’s much to learn in those alleyways about people and places and cultures and even socioeconomic status. I love the sweet surprise of these floral paintings brightening an alley in downtown Clear Lake. Minnesota Prairie Roots file photo May 2015. 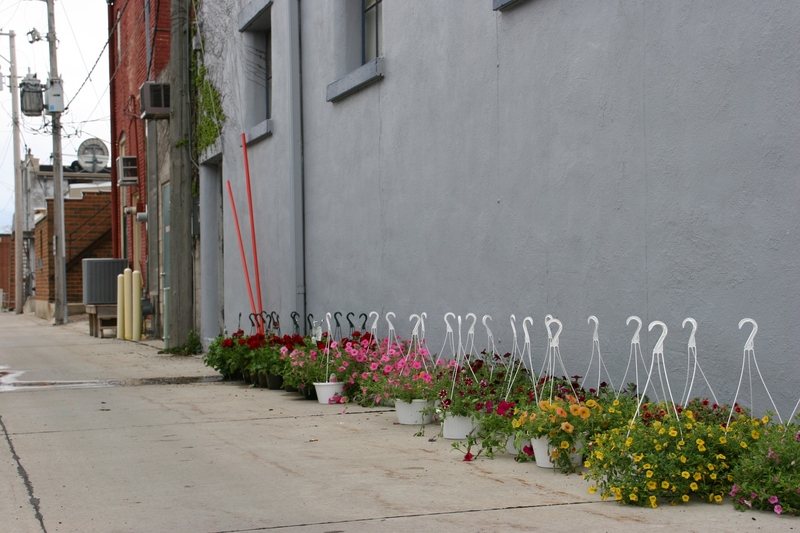 Hanging baskets line the alley behind Larson’s Mercantile in Clear Lake, adding a splash of color to the downtown. Minnesota Prairie Roots file photo May 2015. The Contented Cow opens onto a riverside space between buildings in historic downtown Northfield. Minnesota Prairie Roots file photo October 2014. Looking further down that narrow space, I photographed a wedding party gathering near the Cannon River. Minnesota Prairie Roots file photo. A mural on The Key (youth center) building in downtown Northfield. Minnesota Prairie Roots file photo April 2017. Through the years, I’ve documented many behind and between businesses scenes with my camera. I’ve seen how a community can convert an alley into a lovely and inviting space. 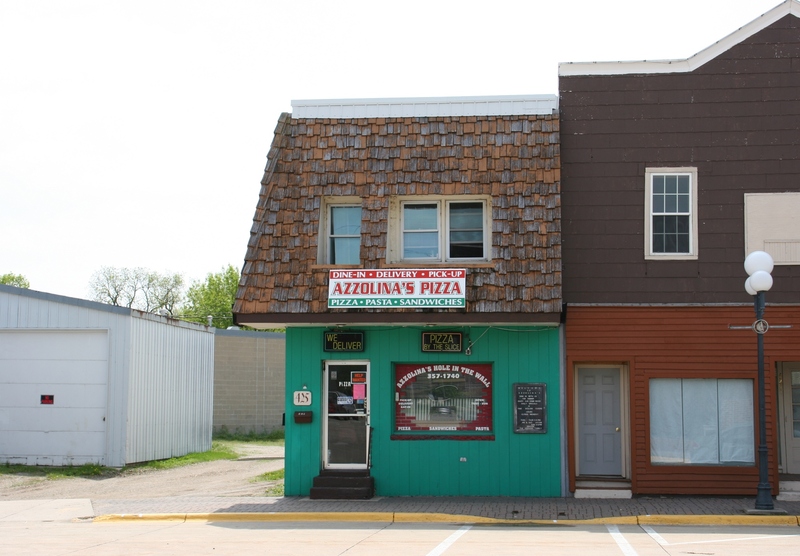 Clear Lake, Iowa, and Northfield, Minnesota, especially, have succeeded with this attention to detail beyond storefronts. 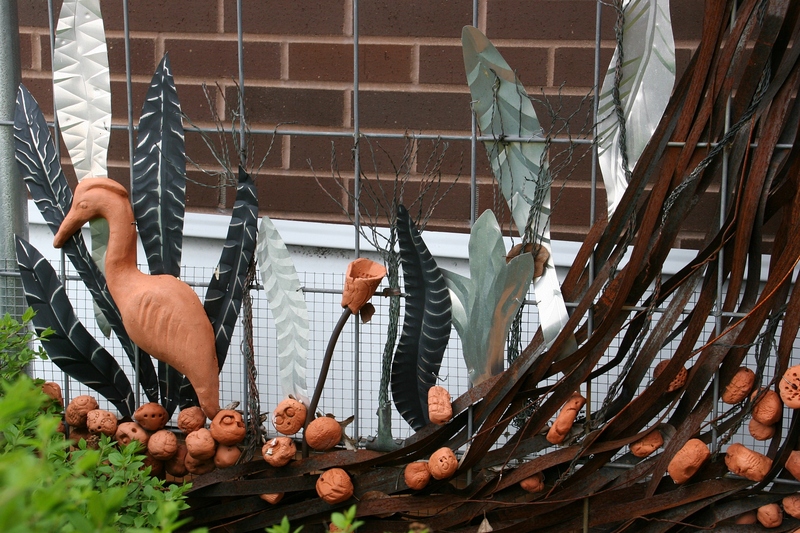 Michelle’s Garden, right next to the alley behind buildings along Faribault’s Second Street and Central Avenue. Minnesota Prairie Roots file photo September 2015. The back of The Crafty Maven (now closed) sat right across the alley from the garden. Minnesota Prairie Roots file photo September 2015. This mural of an iconic scene from downtown Faribault was installed along an alleyway visible from busy Minnesota State Highway 60/Fourth Street in the heart of downtown. Minnesota Prairie Roots file photo. My community of Faribault, too, boasts an alley-side mini park and an alleyway mural creating a more inviting downtown. But dumpsters overflowing with garbage in other sections of the downtown counterbalance the positive efforts. 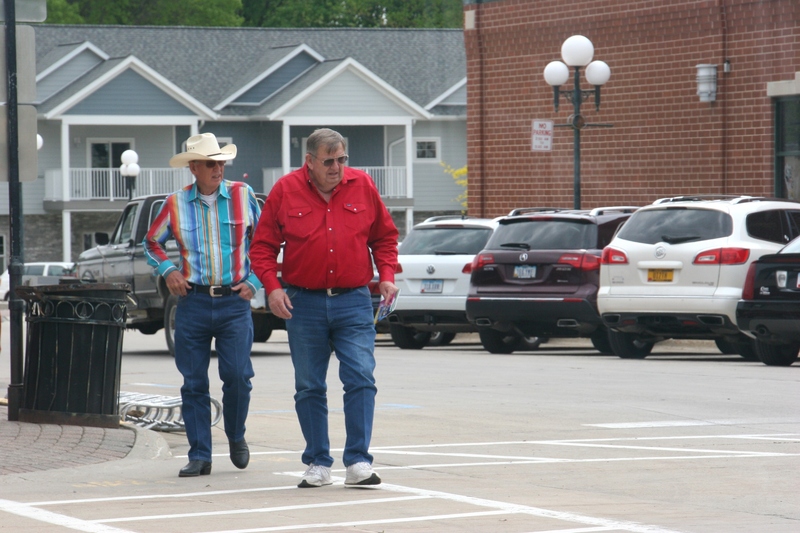 The behind buildings parking lot scene in downtown Faribault highlights the area’s ag base. Minnesota Prairie Roots file photo August 2014. In my opinion, every community should pay closer attention to the details. They are part of the whole, of the impression visitors gather of a place beyond the side we’re supposed to see. THOUGHTS? I’m interested, especially, in hearing how your community or other communities have beautified alleys and/or backs of businesses. IF NOT FOR THE THREATENING SKYLINE, our exhaustion and a two-hour drive home, I expect my husband would have turned into the parking lot of McDonald’s Meats in Clear Lake on a recent Saturday afternoon. He likes meat, especially quality meat from a respected meat market. That’s McDonald’s Meats, a fourth-generation family business around since 1914. I didn’t grow up in central Minnesota (like Randy), but even I’ve heard of this meat market. McDonald’s plays on those strengths, promoting longevity, family and quality products on eye-catching signage. What meat lover, especially someone who loves jerky, wouldn’t want to stop for a free sample at this self-proclaimed Jerky Stop? 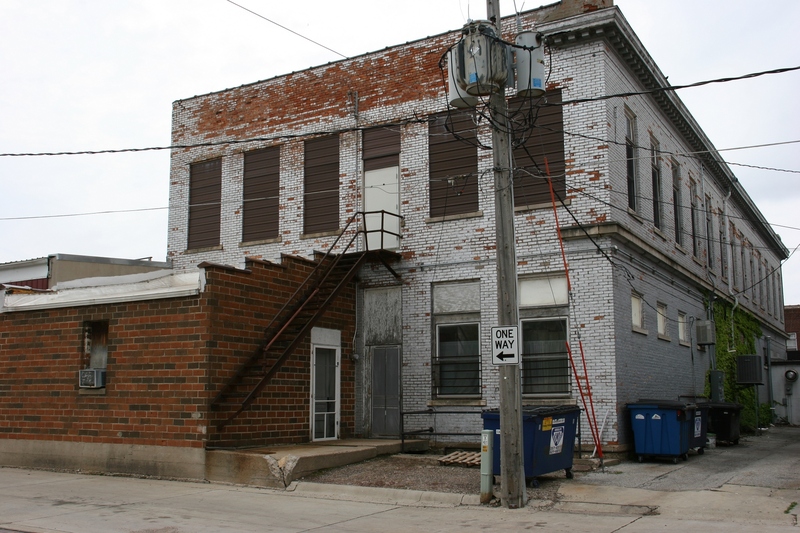 CLEAR LAKE IS AN IOWA town with character. 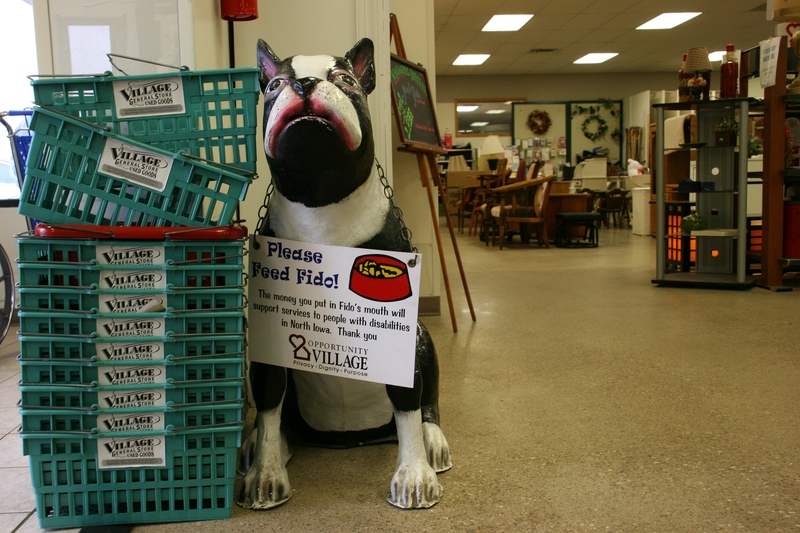 Downtown Clear Lake offers an abundance of locally rooted eateries. It’s memorable in the sort of way that’s good. Main Street good. Welcome to our town good. Meander through the shops, dine in home-grown eateries good. Relaxing outside a Clear Lake floral and gift shop, The Red Geranium. People watch. Kick back on a bench. Dip your toes in the lake or dig them into sand. Even the backs of buildings possess visual charm. Fish or shop. While away a day or two. 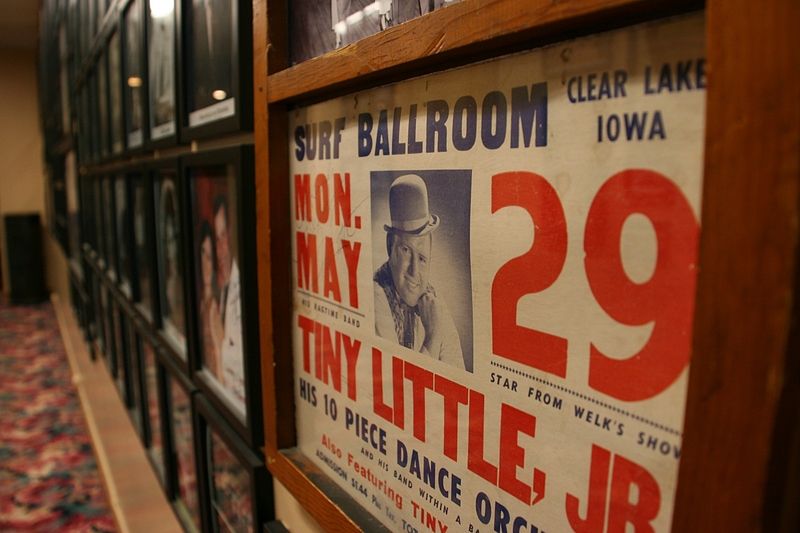 Take in the local history of the Surf Ballroom. Or simply amble downtown, right into a Norman Rockwell type scene. 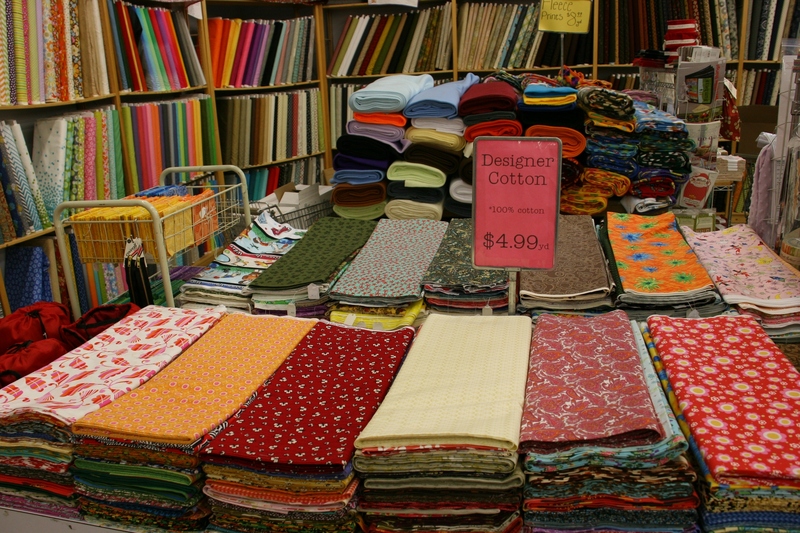 Larson’s Mercantile, like an old-fashioned five-and-dime, has a back corner devoted to fabric. Walk the aisles of the mercantile. Hanging baskets line the alley behind Larson’s Mercantile. Take the back route through the alley. 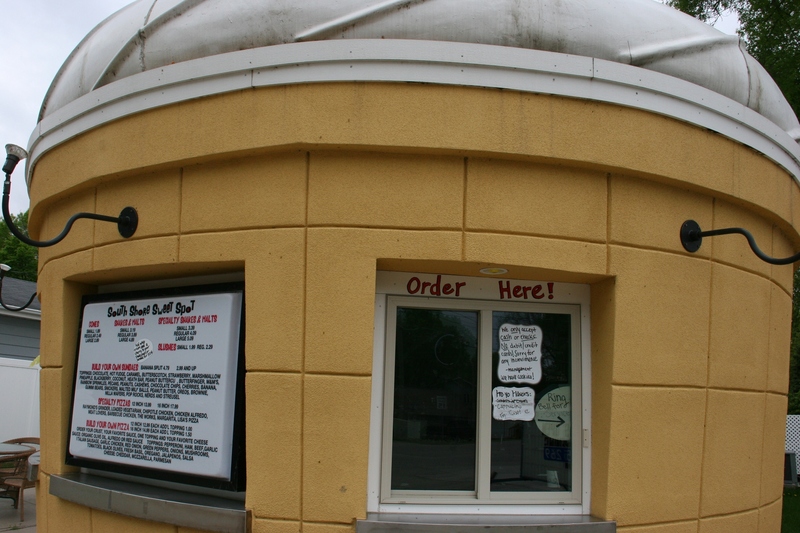 Order a treat from South Shore Sweet Spot, shaped like an ice cream cone. Eat ice cream. Drink beer. Grab a burger. From a window side counter (common in Clear Lake eateries) in a downtown restaurant, I photographed these guys crossing Main Avenue. Come in your cowboy hat or no hat. 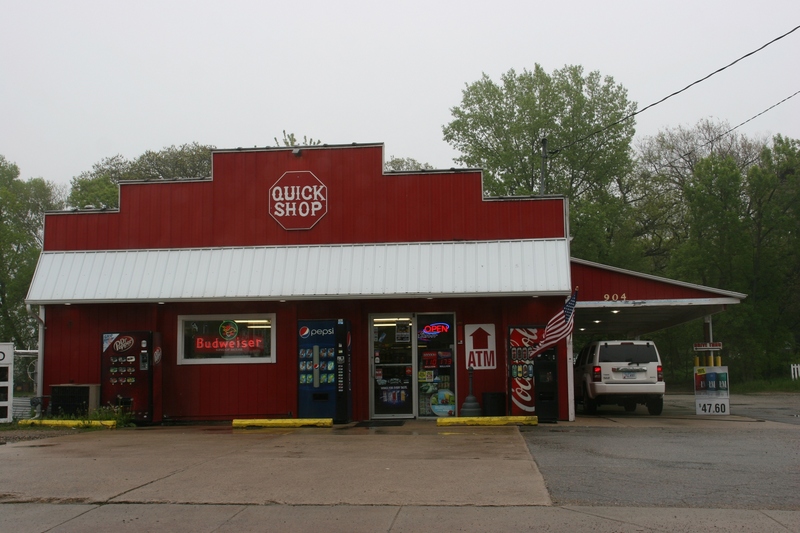 Something I’ve never seen until visiting Clear Lake: a drive-through convenience/ liquor store. 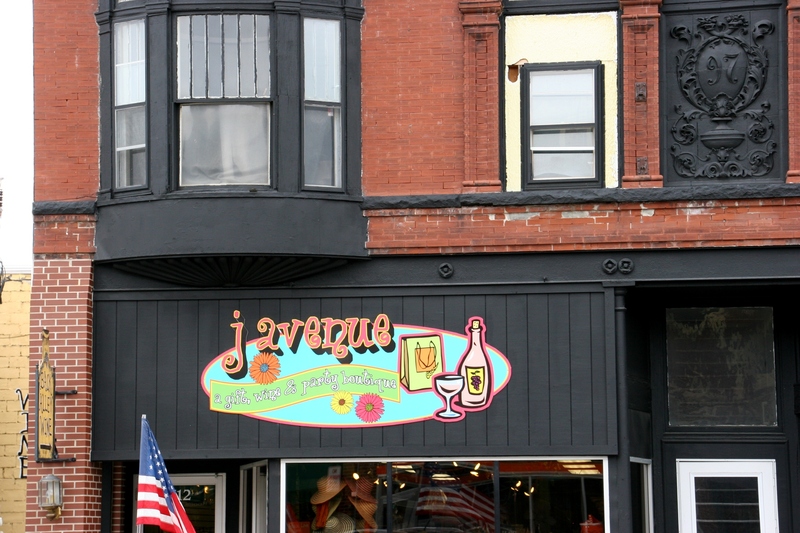 Clear Lake beckons with Americana charm rooted in character and small town Iowa friendliness. FYI: This concludes my seven-part series on Clear Lake. Check back for more posts from my recent overnight visit to Iowa. My husband, Randy, leaves the Guardian Angel Roadside Chapel as Scott Kennedy and his nephew finish cleaning. 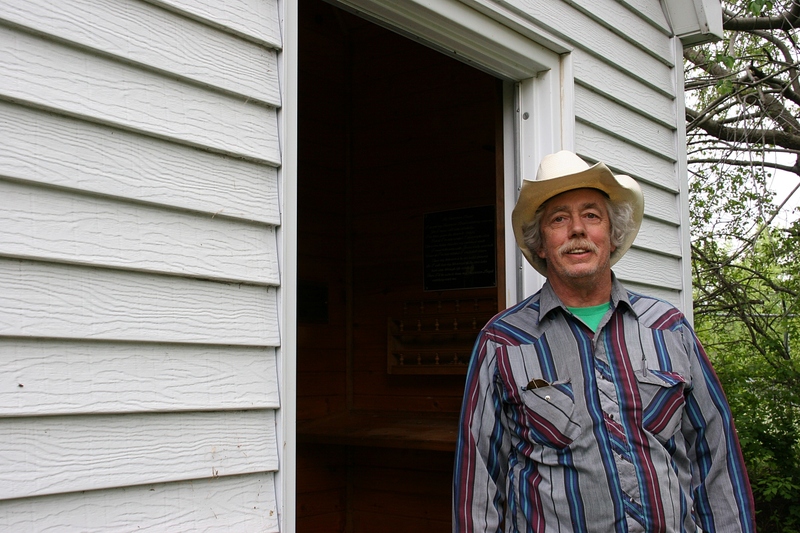 WHEN WE FINALLY FOUND the Guardian Angel Roadside Chapel tucked into the woods along South 24th Street in Clear Lake, Iowa, after we’d asked for directions and still drove by the unmarked landmark, we met Scott Kennedy. Scott Kennedy outside the chapel built in honor of his aunt. He was there with his nephew, an Iowa State University student from the western U.S., cleaning the chapel and grounds for a funeral the next day. I forgot to count the pews. But I believe there are eight or ten, each seating only a few people. 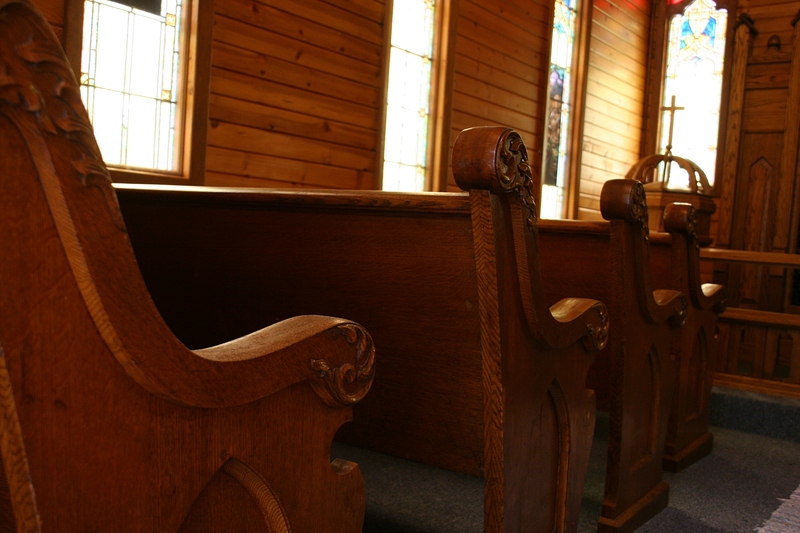 It’s difficult to envision a funeral inside this miniscule place of only a few short pews. But one was planned and the mess from an invading squirrel needed to be swept and gathered into garbage bags. Although I did not see it, my husband spotted the succumbed squirrel. 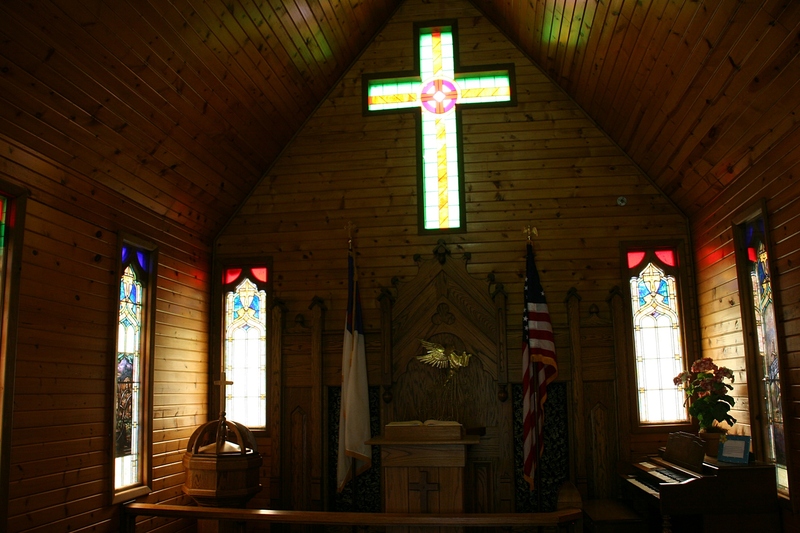 The chapel is beautiful in its craftsmanship. This place is truly a labor of divine love. I was more focused on the chapel interior with its beautiful center stained glass cross crafted by a local artist and side stained glass windows salvaged from Zion Lutheran Church. The cross was designed to attract the attention of travelers along nearby Interstate 35. This truly is a functional church with altar, organ and baptismal font. I was especially delighted to find my favorite bible verse—the scripture that has guided me through some rough patches in life—inscribed on a dedication plaque inside the entry: We know that in all things God works for good with those who love him.—Romans 8:28. Serendipitous? Perhaps. But more likely divine. 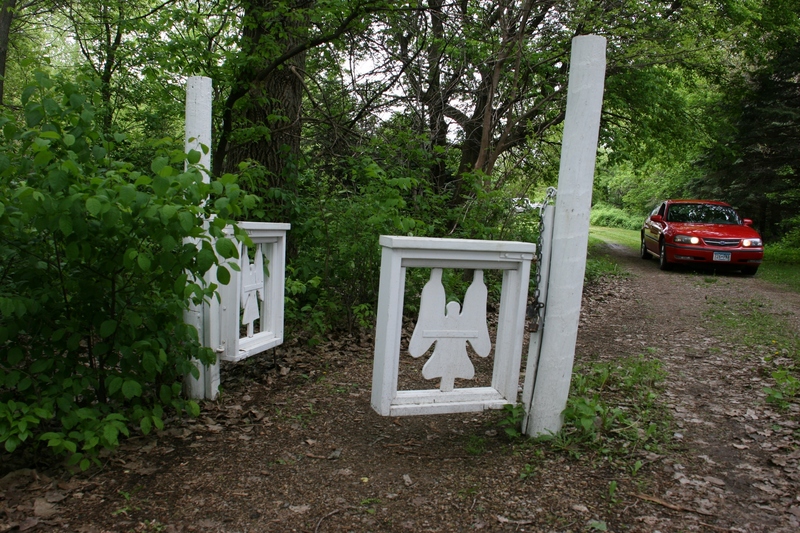 It is the divine intervention of God which led Scott and others to construct the Guardian Angel Roadside Chapel in 1991 in honor of Scott’s aunt, Marguerite Williams. She was convinced that God protected her from kidnapping by a band of gypsies while growing up in Clear Lake. And later, while working at a Chicago medical clinic, Marguerite again experienced God’s protection when she encountered a gang of hoodlums. It was hoodlums, or more accurately criminals, who set fire to the first Guardian Angel Chapel a year after it was built, Scott shared. The blaze was to distract responders from a break-in across town. 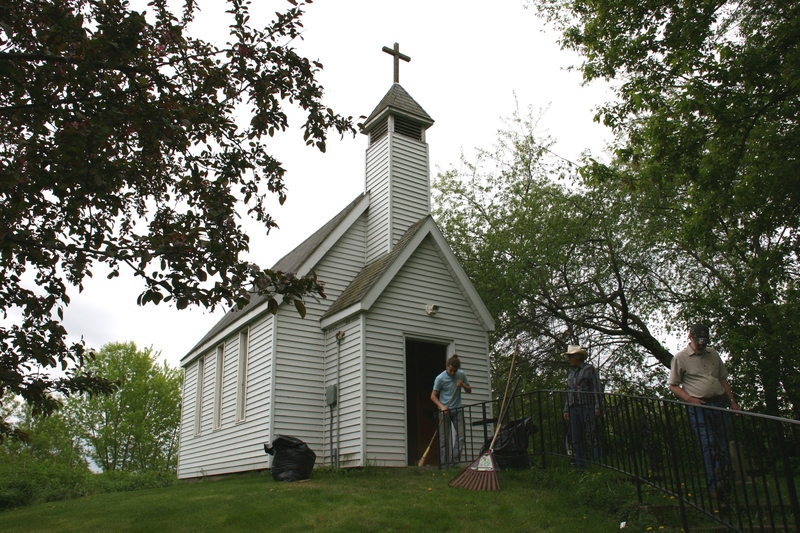 Undeterred, Scott and others determined to rebuild this chapel which was rededicated on April 4, 1993. This chapel was built as a witness to Christ. It is the hope and prayers of the builders that people worshipping here will be closer to Christ and will have their own guardian angel look after them. This is looking toward the highway off which the chapel sits atop a hill in a wooded area. FYI: The chapel is open daily from dawn until dusk, although I am uncertain whether it’s open during the winter months. Check back tomorrow for my final installment in this seven-part series on Clear Lake, Iowa. ART IS, PERHAPS, in the eye of the beholder. 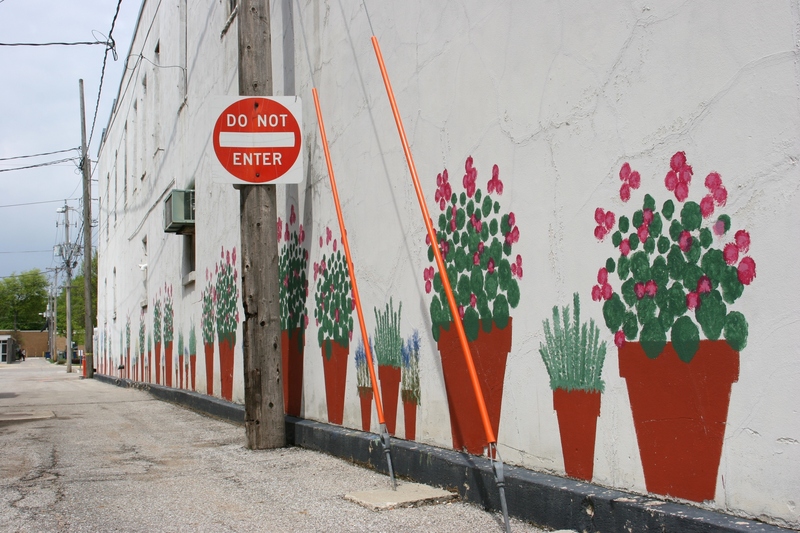 I loved the sweet surprise of these floral paintings brightening an alley in downtown Clear Lake. In Clear Lake, Iowa, I beheld an abundance of art. Everywhere. In the local arts center. Inside and outside shops. On historic buildings. In words, colors, designs, shapes. Sometimes obvious, sometimes not so much. 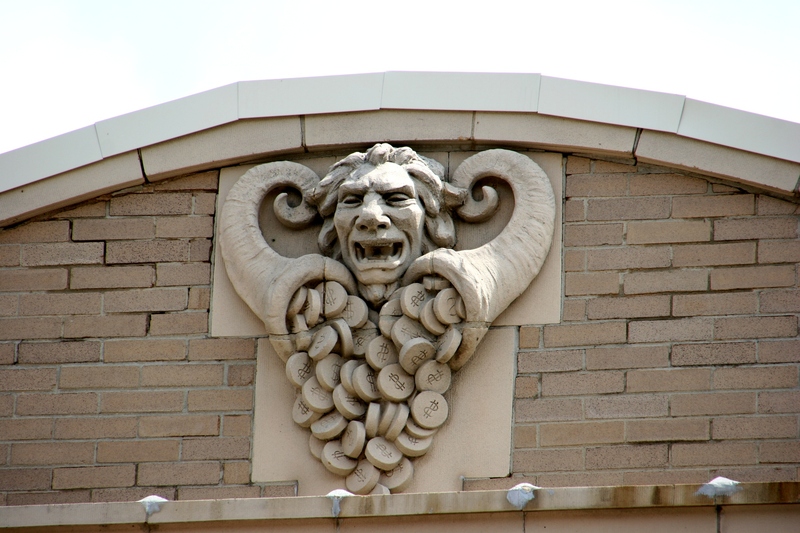 Historic buildings, like this one housing Thrifty White Drug, oftentimes are detailed in art. You have to look up to see this intriguing sculpture. Look up. Look down. Look around. Simply look and you will see it. 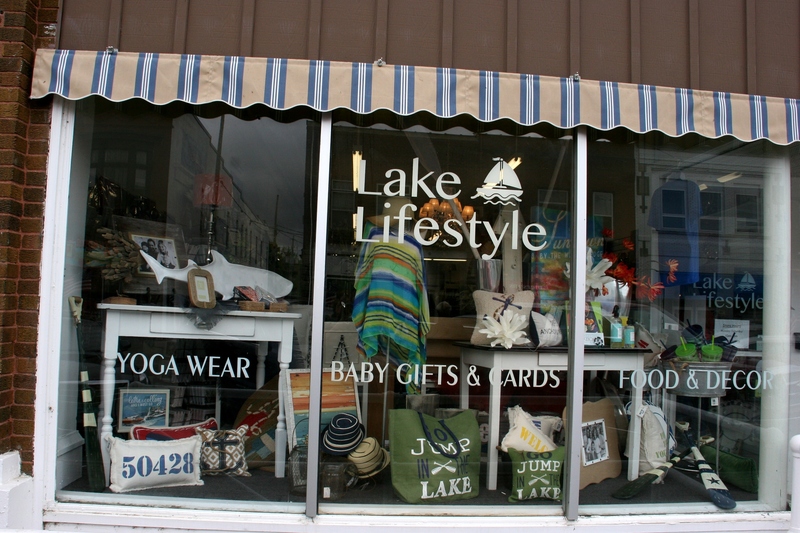 Creative window displays draw shoppers into businesses like Lake Lifestyle. I appreciate a community with details that visually please me. And Clear Lake does. In so many artsy ways. 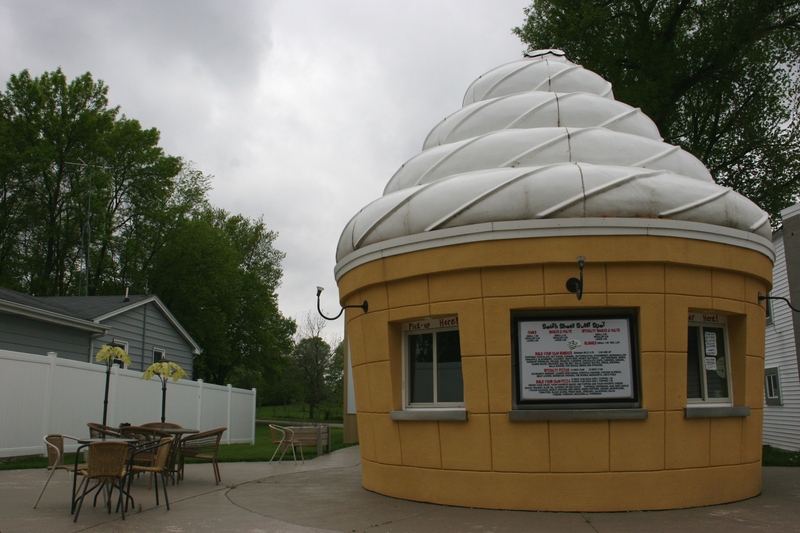 South Shore Sweet Spot was not yet open for the season when I visited Clear Lake. But I could admire the artsy architecture. No mistaking this for anything but a place to buy ice cream treats. 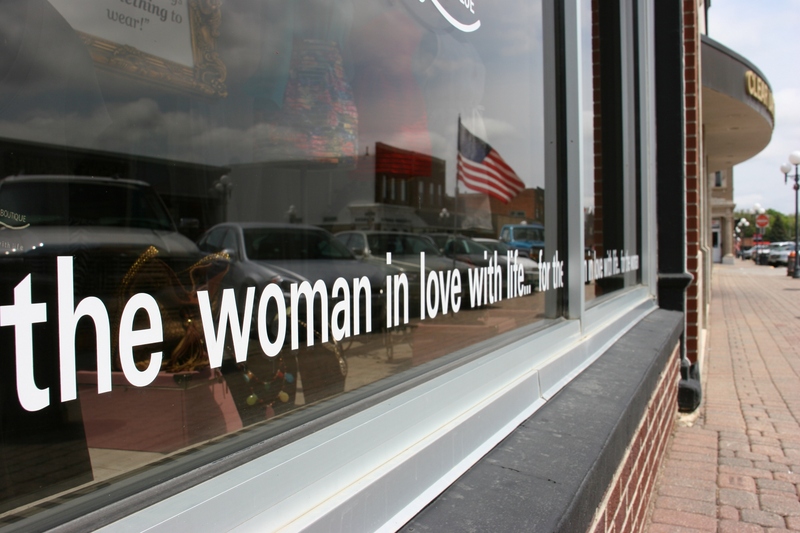 On a downtown shop window, inspiring words. Poetry really. 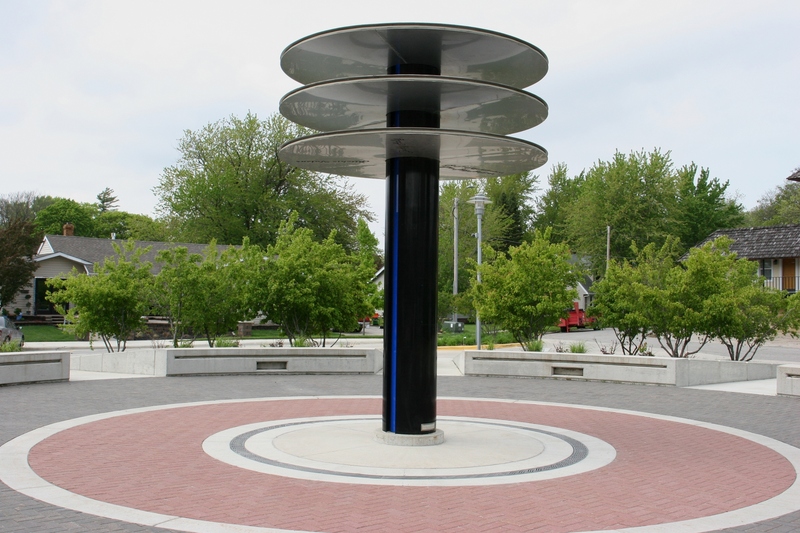 This stacked album sculpture in Three Stars Plaza next to the Surf Ballroom honors Buddy Holly, Ritchie Valens and J.P. “The Big Bopper” Richardson. All three musicians died in a 1959 plane crash near Clear Lake after performing at the Surf. 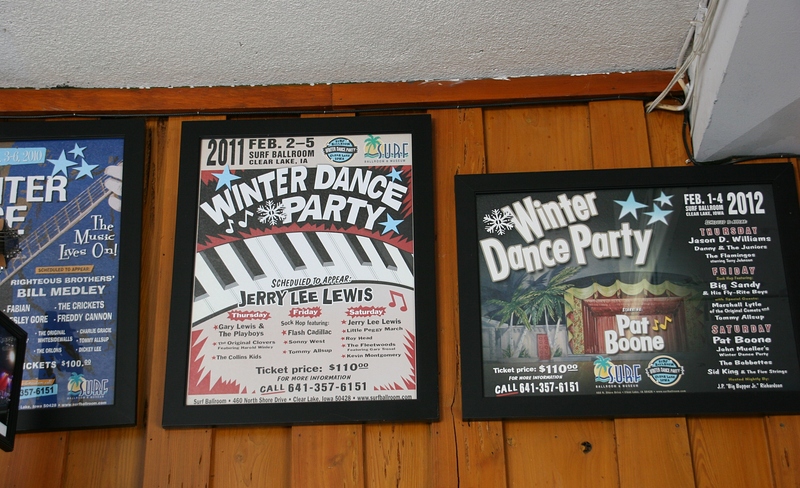 All around town you’ll see posters from the annual Winter Dance Party at the Surf Ballroom. I found this one at the AmericInn Hotel. 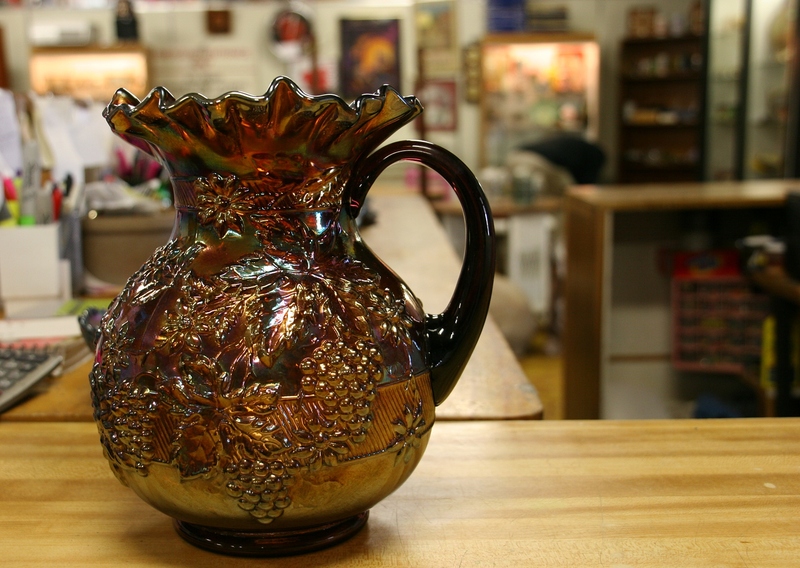 Even collectible glassware is art, including this Carnival glass pitcher at Collectors Wonderland. Shelves and shelves of artsy Clear Lake apparel fill shelves at Larson’s Mercantile. 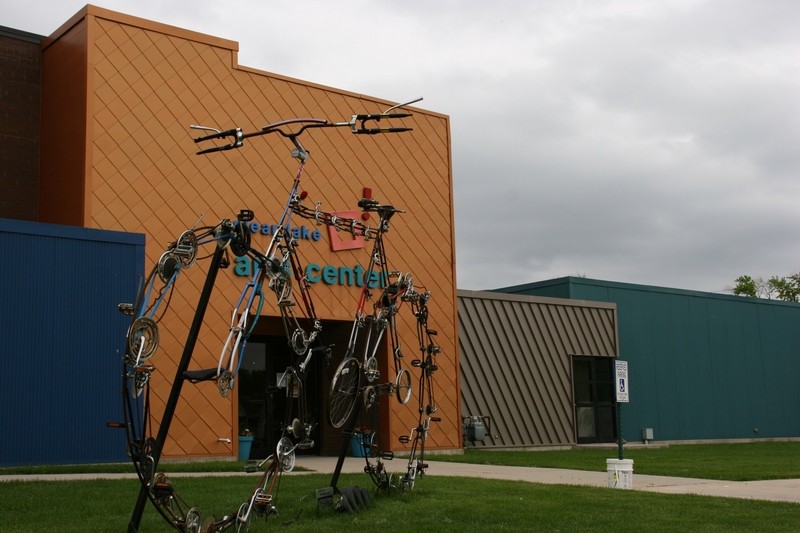 The Clear Lake Arts Center centers the arts in this community. It’s impressive. 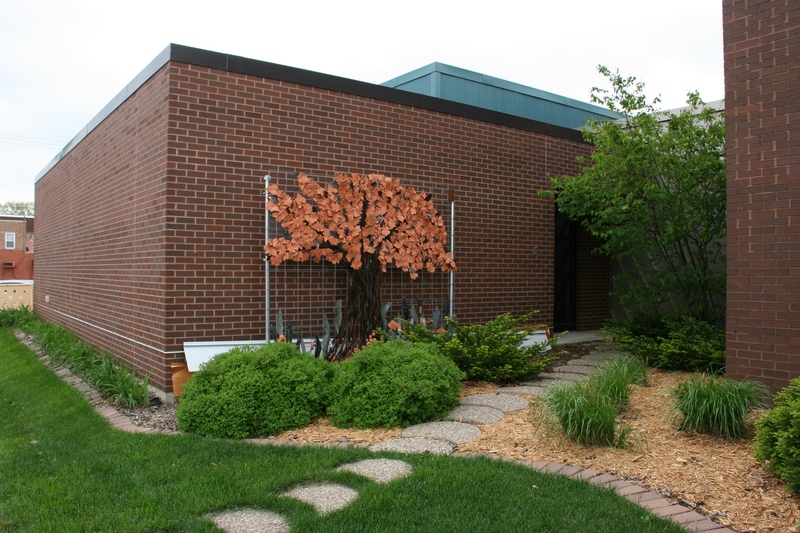 Iowa artists Pam Dennis and Ryk Weiss collaborated with local students and adults to create this tree sculpture from cattle panels, metal banding and clay. 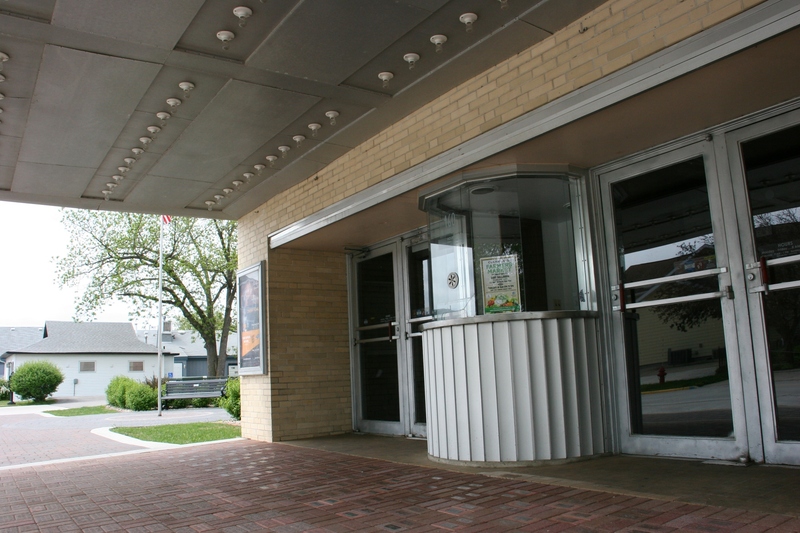 It is located at the Clear Lake Arts Center. The tree sculpture (above) calls for an up close study of details. 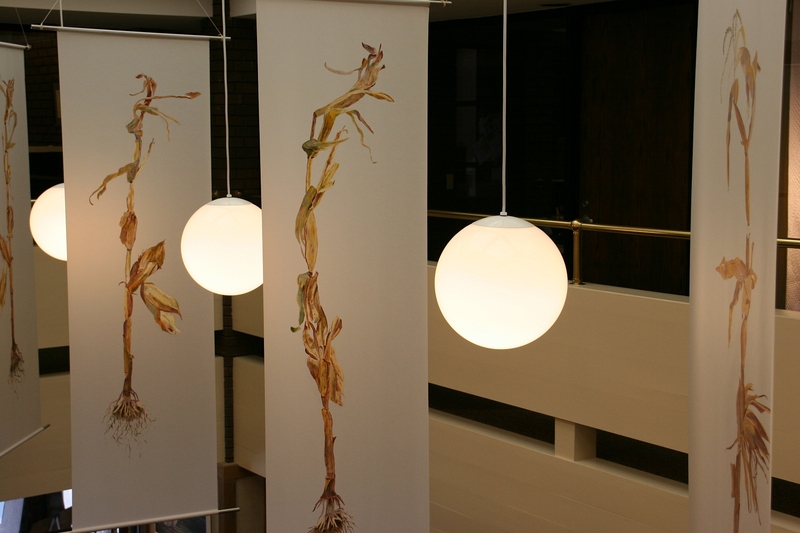 Inside the Clear Lake Arts Center, I delighted in cornstalk panels suspended from the ceiling. 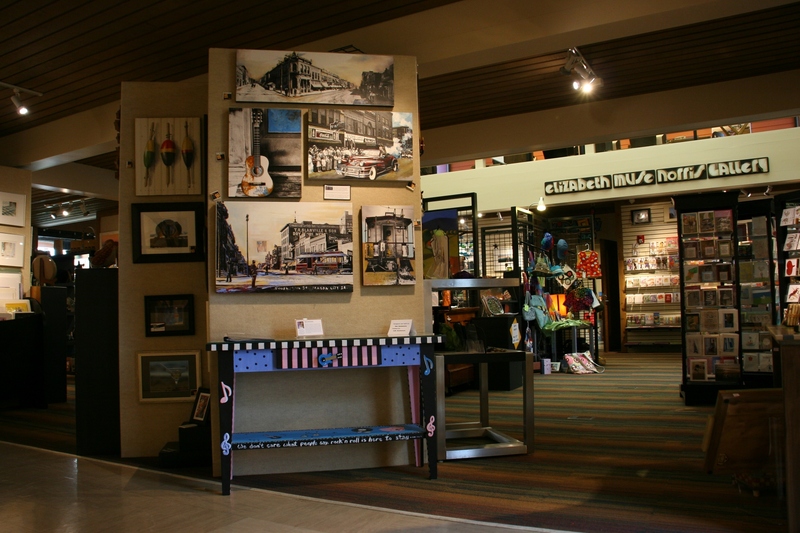 The arts center galleries showcase an abundance and variety of outstanding art. There’s art in signage and architecture. An artsy scene (in my opinion) at the Village General Store, a second-hand store along the highway on the north side of town. Signage always grabs my attention, including these graphically pleasing signs in a downtown window. 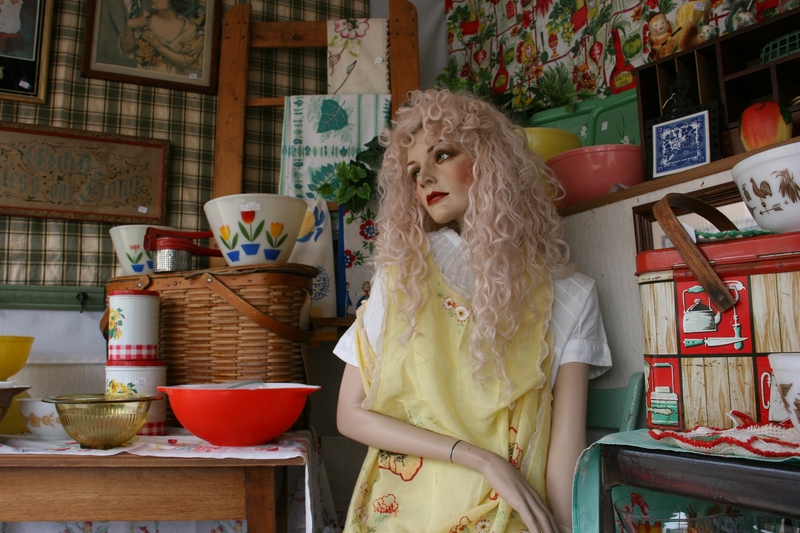 Window displays, like this one at Collectors Wonderland, are art in themselves. 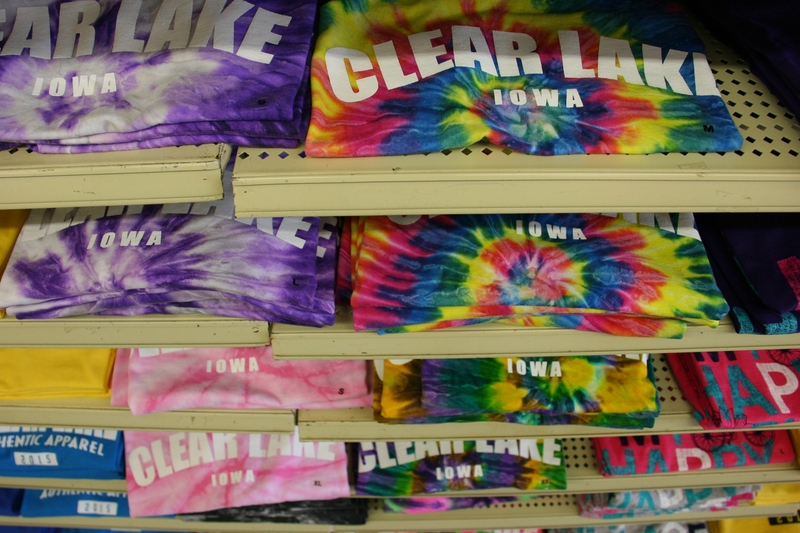 FYI: Check my posts from last week to read my first four photo stories from Clear Lake, located along Interstate 35 in northern Iowa. Two more installments remain in this series. My husband exits the historic Surf Ballroom. 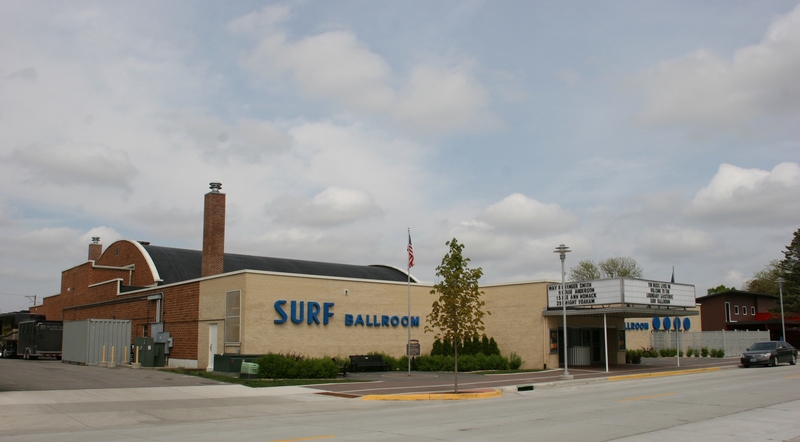 WHEN I MENTIONED to a friend that my husband and I were going on an overnight get-away to Clear Lake, Iowa, he immediately asked if we were touring the Surf Ballroom. We were. A broad view of this massive ballroom which seats 2,100. The Surf is the focus for many visitors to this north central Iowa community. It wasn’t our main reason for traveling here. But we knew we couldn’t visit Clear Lake without seeing the famous Surf, site of Buddy Holly’s final Winter Dance Party performance before he, Ritchie Valens and J.P. “The Big Bopper” Richardson died in a February 3, 1959, plane crash along with the pilot. Another tribute to the Surf’s most memorable performer, rock n roll legend Buddy Holly. Now I’m not much of a music history person, nor a person with musical talent. I can’t read a note. I don’t have a particularly good singing voice. I typically cannot tell you who sings what and even had to ask my husband, before our arrival at the Surf, what songs Buddy Holly sang. He cited Peggy Sue and That’ll Be the Day. Looking toward the outside, this interior set of lobby doors are hefty and heavy. To the right is the original coat check area, not shown in this image. This sign summarizes the importance of the Surf. Yet, even for someone like me who is rather musically illiterate, the Surf proved an interesting place. 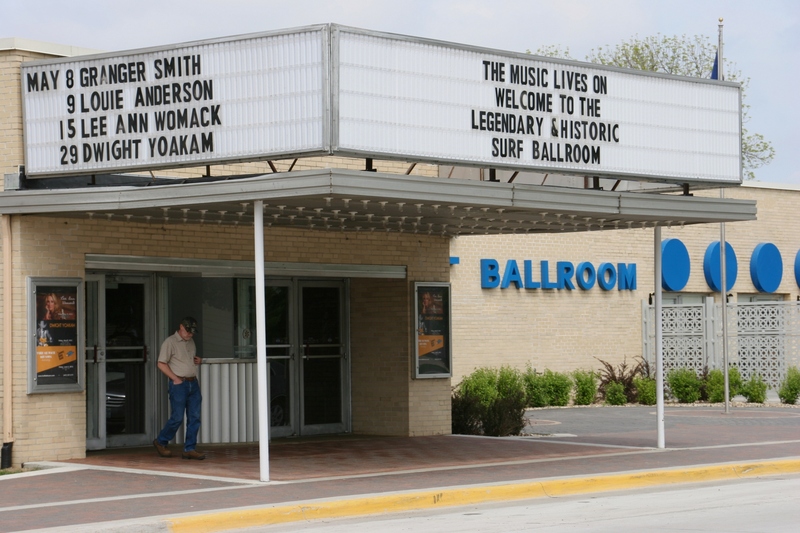 Built in 1948, the current ballroom (the first burned down) is on the National Register of Historic Places. And rightly so. 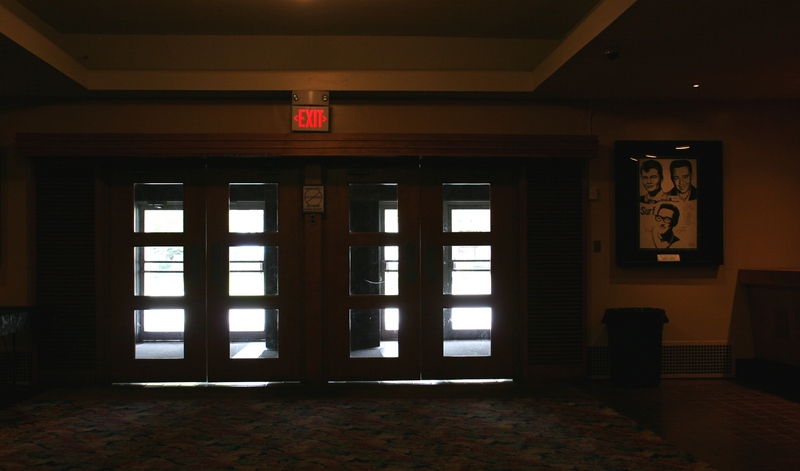 From the exterior ticket booth to the heavy doors that lead into the dark lobby, where you can check your coat, the Surf holds that feel of yesteryear. It’s difficult to explain. But you feel that sense of entering a different world from a bygone era the minute you step inside. As if you’ve left Iowa. And today. Just a sampling of those who have played the Surf. 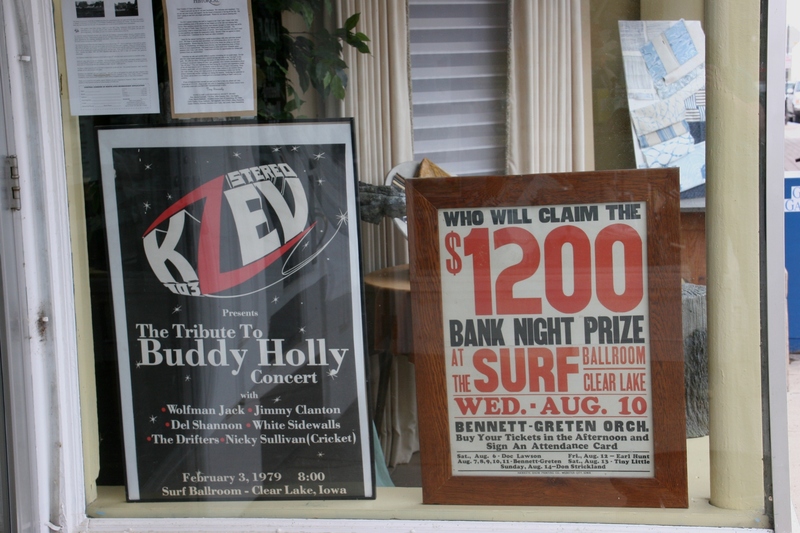 More historic memorabilia of Surf concerts. 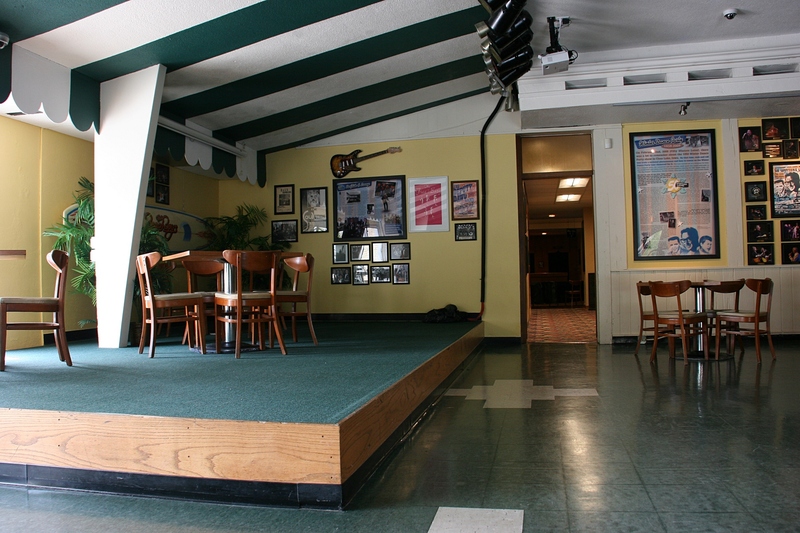 The lounge area features a stage, bar and lots more memorabilia. 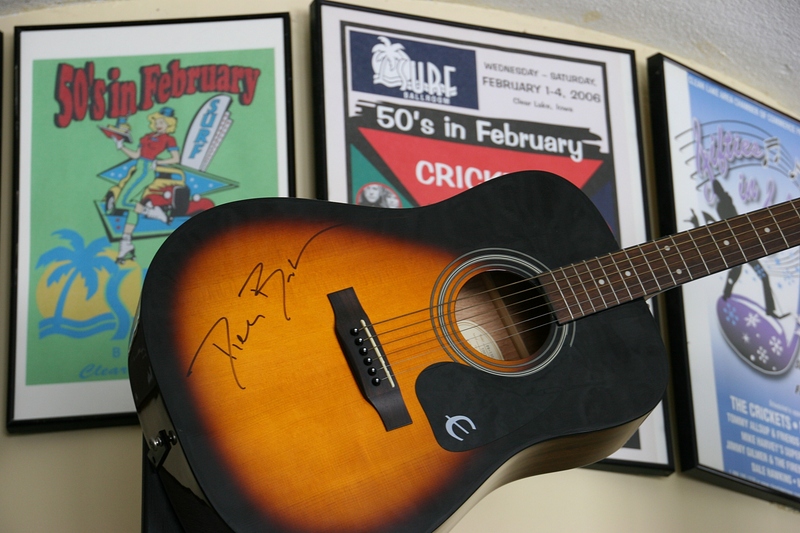 You’ll spot numerous signed guitars on display. 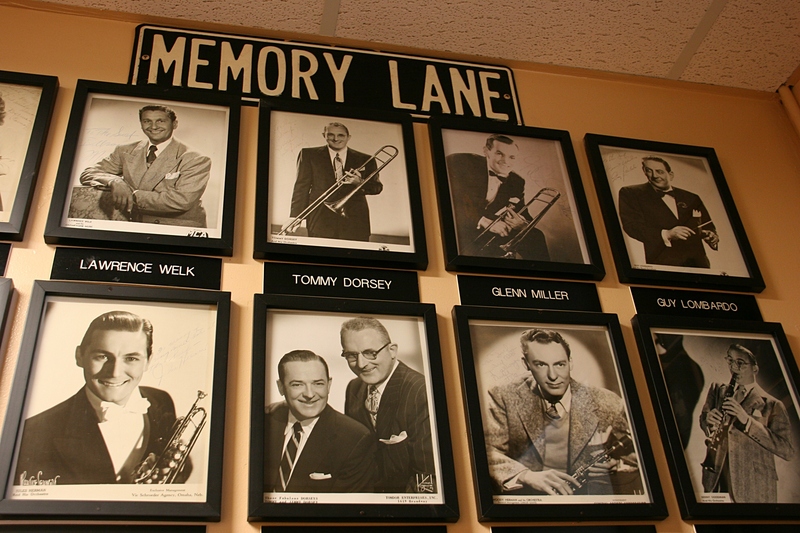 Here you’ll discover a hallway museum of musicians’ photos, posters and history. 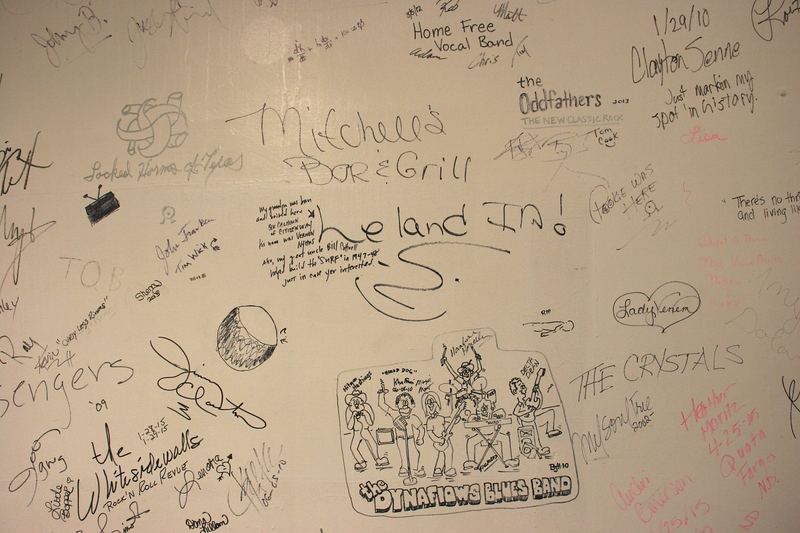 And inside the lounge you’ll see stars’ guitars and more photos and other tributes to those who have performed here. If a musician’s picture is displayed, then he/she’s played/been here. On the Friday afternoon we arrived at the Surf, we almost didn’t make it into the actual ballroom. Black curtains were pulled across two entrances and marked by “closed” signs. 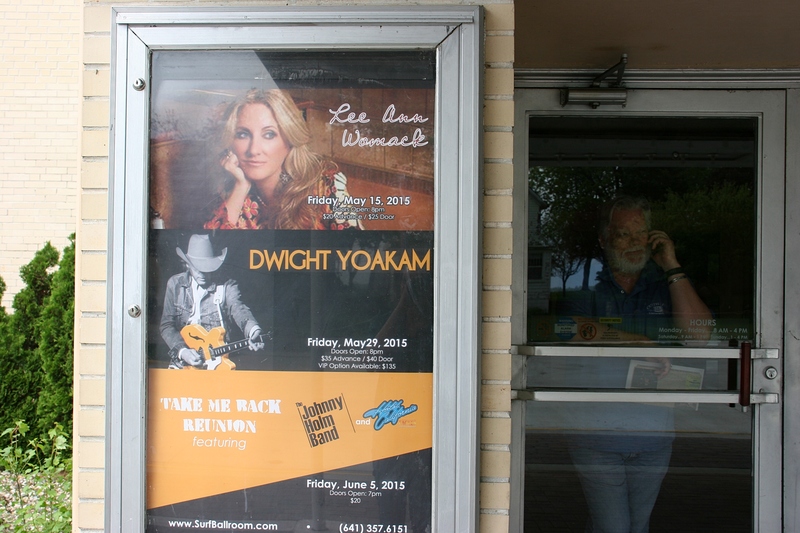 I peeked through the curtains to see musicians for Lee Ann Womack setting up inside. I failed to notice on the Surf website that the dance floor occasionally closes if a concert is scheduled. So be forewarned: Check the Surf calendar. Even better, call ahead. 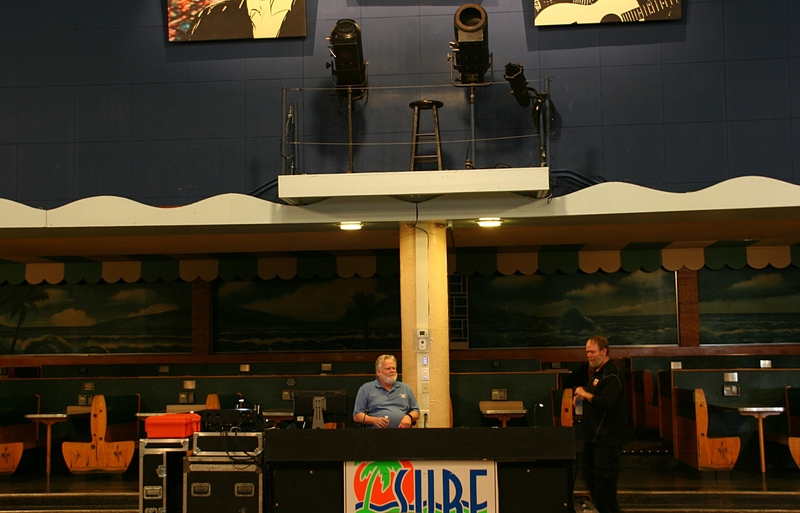 But then, as luck would have it, Mark, who’s been working Surf security since 1978 and clearly loves this place and his job, parted the curtains and invited us inside with the admonition to keep our distance from the stage. He’d overheard our disappointment and said, “Since you drove a long ways…” We’d traveled only 85 miles. But another couple had driven nearly four hours from Omaha. In the back are layers of booths, all original, and beach-themed murals. 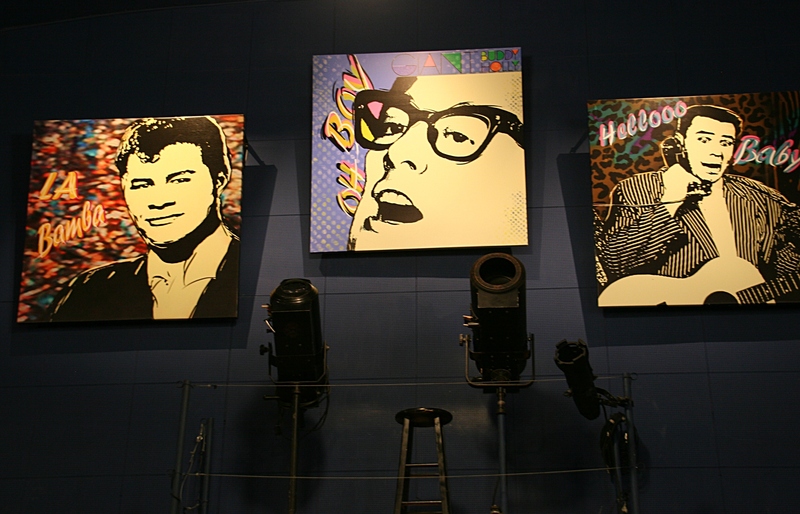 Portraits of Ritchie Valens, left, Buddy Holly and J.P. Richardson hang inside the ballroom. Each February, the Surf still hosts a Winter Dance Party. I wished I could have lingered longer in the ballroom, asked Mark to switch on more lights for better photos. But I didn’t press my luck. If not for his graciousness, I would have remained on the other side of those black curtains. 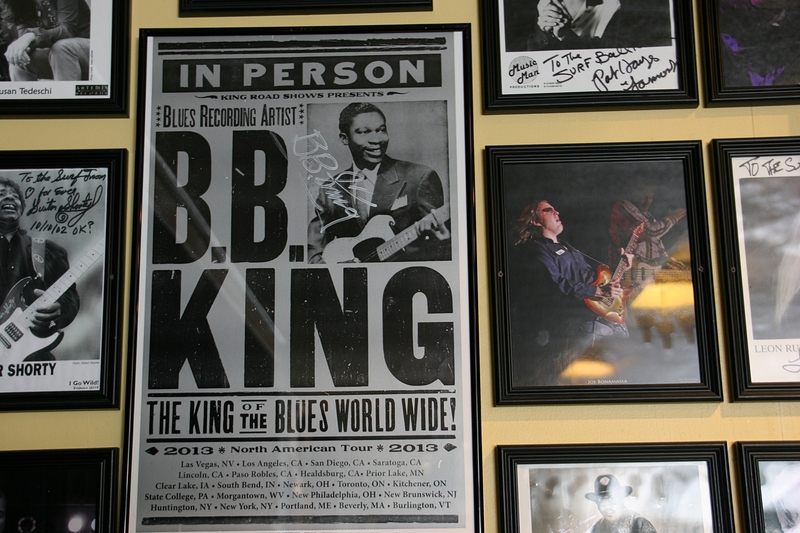 The day before our visit, the king of blues died. B.B. King’s promotional poster hangs in the lounge. Lee Ann Womack’s band was setting up on the afternoon of our visit. This was snapped just outside the front entry doors. 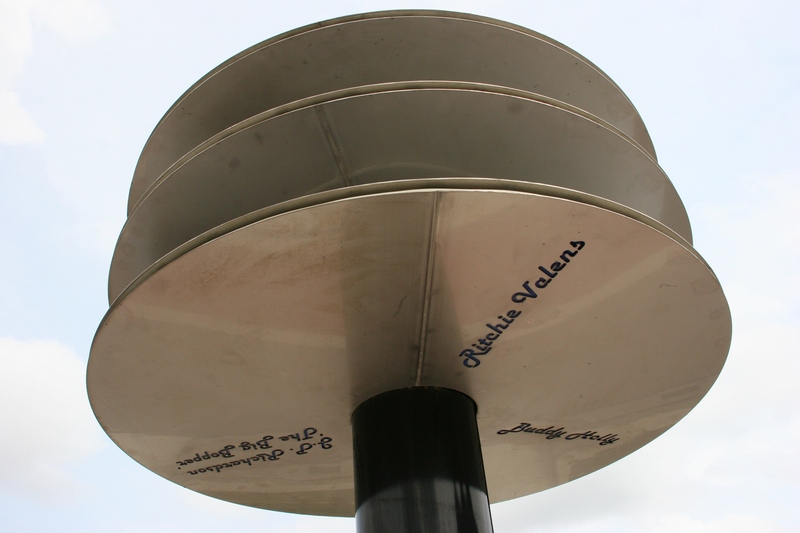 About a block away, this outdoor turntable/album sculpture at Three Stars Plaza honors Holly, Valens and Richardson. 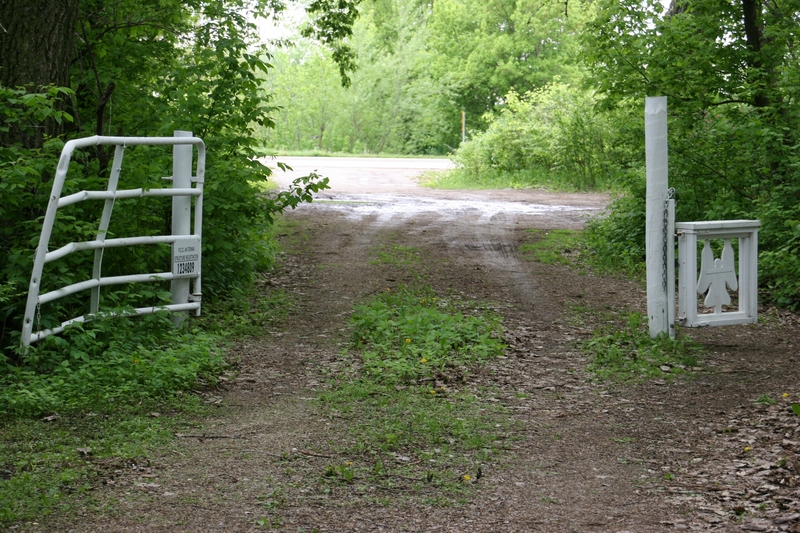 You can also visit the plane crash site about five miles from town. Because of rainy weather, we did not go there. FYI: Please check back next week for the three remaining installments in this series of seven posts from Clear Lake, Iowa.